A spokesperson for supermarket giant Asda has said popular phone apps have had a knock on effect on camera tech. 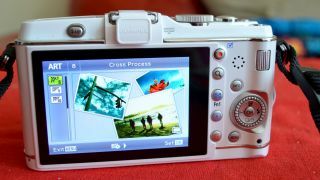 Asda, which sells a range of cameras across different categories, spoke to TechRadar about different trends it had witnessed in the industry. It will probably come as no surprise to learn that entry level compact cameras are down in volume, following worldwide trends, but, according to Matt Collinge, camera buyer for the company, customers are saving up to purchase higher quality products with what he calls "additional benefits." "We're also finding that products with 'creative filters' such as fish eye, vignetting and colour effects are being received warmly, which I would attribute to these features being ever present on mobile phone devices - the Instagram effect," Collinge said. Instagram, which was originally available only for iOS, but recently also became available for Android allows users to apply a variety of retro effects to images snapped with their devices. It was bought out by Facebook in April for $1billion. A number of modern cameras include creative or art filters which allow images to either be shot with filters or edited post-capture in-camera. Originally the preserve of compact cameras, such filters are also now popular in compact system cameras and are also starting to appear in DSLRs.